From there, they are recycled into decking and other building materials by Trex Company in Winchester, Va., said Kim Nemire, the sustainability coordinator for the race. “Our goal is to divert as much as we can from the landfill,” said Nemire, who has led the race’s sustainability team for the past five years. The heat sheet program has proved to be successful, and will be continued for the 2019 race next month. It’s all part of the Cherry Blossom’s efforts to be more environmentally conscientious and reduce its carbon footprint. 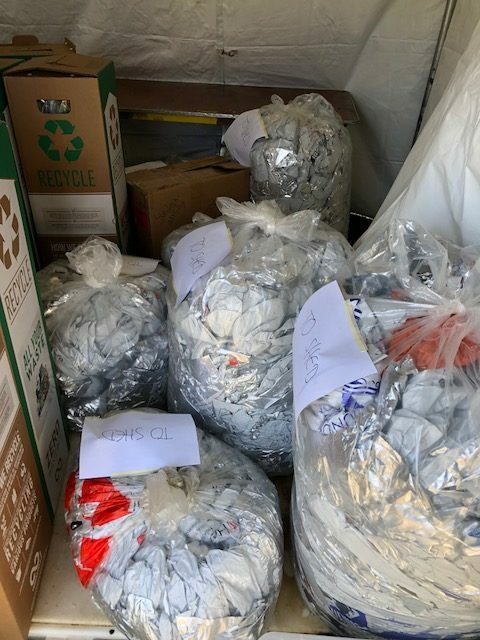 The race generates approximately 20,000 pounds of waste, Nemire said, yet each year the team works to prevent about 90 percent of it from going to the landfill or incinerator. The Cherry Blossom races have been awarded Gold Level Inspire Certification by the Council for Responsible Sport for its work. The Marine Corps Marathon has earned the same certification for its achievements. The push to for more environmentally friendly running events has grown over the last few years, said Shelley Villalobos, managing director at Council for Responsible Sport. Still, an eco-friendly focus is often seen as a “nice to have, not a need to have,” Villalobos said. The 2017 Running USA survey, found that just 18 percent of the more than 6,800 respondents said they chose to participate in an an event because it was sustainable or had an environmental initiative. “I think that people are becoming aware of individual wellness and planetary wellness, and it’s not happening as quickly as it needs to,” Villalobos said. 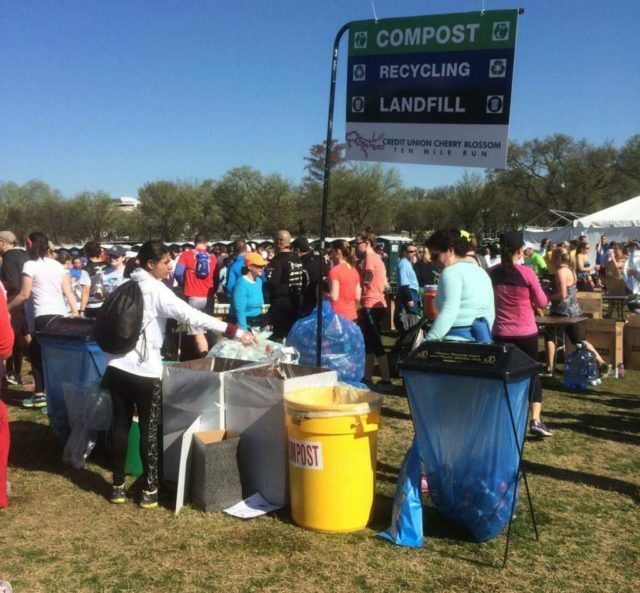 Cherry Blossom and Marine Corps Marathon are just two races on the list of events that have earned some sort of certification through the Council for Responsible Sport. To achieve a certification, events have to apply and develop a plan to adhere to as many of the council’s more than 60 pre-outlined best practices. The council will observe the event’s progress and if it can meet just shy of 30 of the best practices the event can achieve a Level 1 certification, Villalobos said. More best practices and benchmarks means a higher certification. Races are great examples of sustainable events because they are so involved in the community and its identity — a huge element of the process, Villalobos said. Putting on a sustainable event can be made more difficult just by the nature of its location, Villalobos said. A zero-waste, low carbon emissions goal can vary depending on the venue, city and state hosting an event. Some places, such as D.C., offer plentiful options for public transit, bike sharing or carpooling; other locations may not be able to give attendees as many choices. And despite events’ recycling ambitions, some cities don’t hesitate to take everything to the landfill, Villalobos said. “It’s one of the most challenging things race organizers are facing when trying to go green,” she said. What happens to all of those bananas peels? 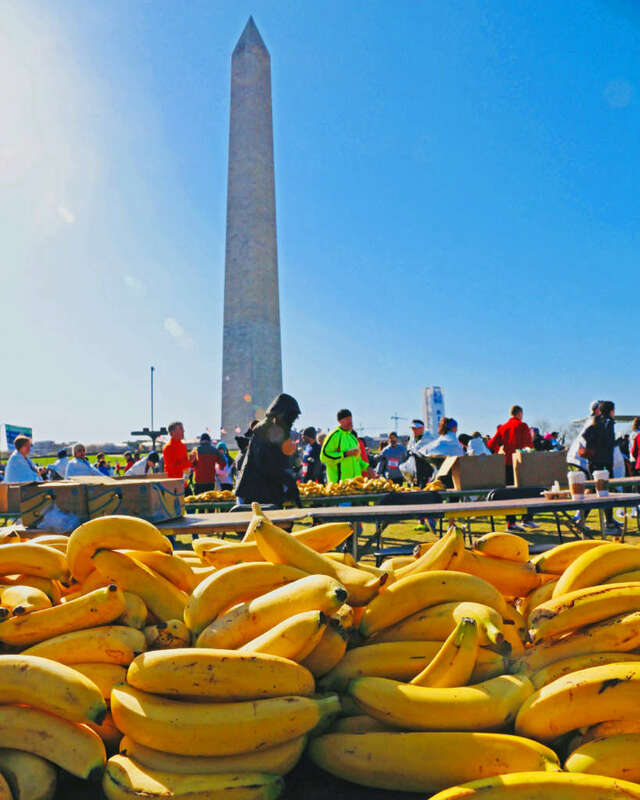 Few things in life are guaranteed the way bananas are at running events. Each year, the Cherry Blossom volunteers pass out bananas to its participants, and with that comes thousands and thousands of leftover peels. It’s been a welcome challenge to the race’s sustainability team. Each year, nearly 2,000 pounds of banana peels, other food waste and compostables go to Veteran Compost — a 30-acre farm in Aberdeen, Maryland, that collects organic waste and turns it into organic compost that’s ready for your farm, garden, lawn or landscape. “All of our banana peels and wax-lined cups and a lot of the paper type things can be composted. That’s where a good chunk of organic things go,” Nemire said. And for those who pass on the banana, there’s a plan for the uneaten ones, too. Last year, the race donated about 20 cases of bananas to a local pantry. “If you just think about the number, 20,000 pounds of material alone for one event — multiply that by thousands and thousands of event around the world. What a huge impact that is to have a responsible approach to it where you’re not sending everything to the landfill,” Nemire said. Beyond food, there’s a plan for the clothing ditched before the race starts, too. After last year’s Cherry Blossom races, 750 pounds of clothing left at the starting line was donated to Big Brothers Big Sisters of National Capital Area, Nemire said. Also, water bottles and other plastics from race day are recycled. Last year, more than 100 pounds of plastics were collected and recycled responsibly. In the end, it’s not only about making sure the right things get recycled, composted or donated — it’s about leaving the condition of the community better than you found it, Nemire said. “We’re on the [National] Mall — we are set up around the Washington Monument — we can not leave that in bad shape,” she said. Runners can play a role in helping create an environmentally conscious race. Nemire suggests runners make sure their waste gets in the correct receptacles. The Cherry Blossom races rely on a cadre of volunteers to help make sure runners know where to throw away plastics, banana peels, heat sheets and more. There are about 40 volunteers on race day who assist in that mission. And don’t just throw stuff on the ground, Nemire pleads. Runners can also unify and make sure races acknowledge their priorities for an event, Villalobos suggested. “Runners can find something to be civically engaged in, and then bring that initiative or project to the race organizers and see if there is an opportunity for collaboration,” she said. Also, races should find out what matters the most to them and focus on how they can make a difference in that sphere. “I would love to see every event list out their top three values — we know you need to make money, but what else matters to you?” Villalobos said, adding that races can tap into their networks of vendors and industries to brainstorm better ways to put on a event in an eco-friendly way. Running events are gatherings of people who prove they are capable of setting goals and achieving them, and runners should expect the same of the events in which they participate, Villalobos said. Having long-term, sustainable goals not only improves the community for its runners, but also builds loyalty, she added.